With Picture Dial you can dial any phone number and launch any application in main memory. You can add unlimited picture IDs to the Ribbon. 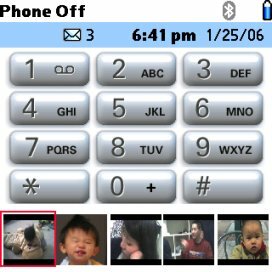 The app supports any jpg image or you can snap a photo with the Treo camera. PictureDial comes with a free trial. It costs $12.95 for the fully registered version, but is on sale for $9.95 until Feb 17th. It takes up 120k of memory and requires a external SD/MMC card.